The Group Licensing Initiative, formed in 2002 under the umbrella of HSLANJ, researches, approves and establishes relationships with vendors, negotiating all pricing and assisting members with licensing needs. The National Network of Libraries of Medicine, Mid-Atlantic Region (NNLM/MAR), and Southeastern/Atlantic Region (SE/A) fully recognize and endorse the HSLANJ Group Licensing Initiative as the lead organization capable of assisting libraries in their efforts to utilize multi-dimensional electronic resources. The Group Licensing Initiative is managed by medical librarian/consultant Robert Mackes and guided by a committee comprised of members from different-sized health facilities in the region served. There are more than 130 participants, representing a wide variety of hospitals and medical institutions, but linked by one common bond: the need for high-quality, cost-effective electronic resources. 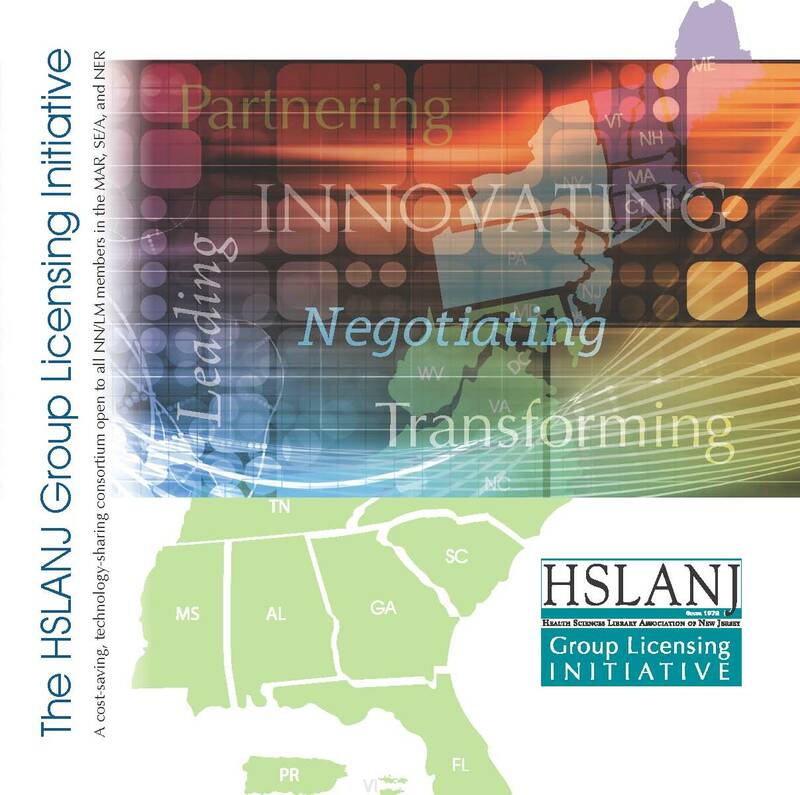 To our knowledge, the HSLANJ Group Licensing Initiative was the nation’s first group licensing consortium specifically for the benefit of hospital libraries. Hospitals throughout New Jersey and Delaware successfully linked through initial efforts nearly a dozen years ago. Still gaining momentum, the group expanded into additional mid-Atlantic markets such as Pennsylvania and New York thanks to funding support from NNLM/MAR beginning in 2010. Full participation was opened to all medical librarians in the MAR in 2012; by 2014, all medical librarians in the SE/A were welcome to participate. In 2017, another milestone was achieved with participation opening to all medical librarians in the NER. The entire region served by the HSLANJ GLI encompasses 20 states plus Washington, D.C; Puerto Rico; and the U.S. Virgin Islands. I think it’s an excellent project and Robb is great to deal with—very responsive. His leadership is invaluable and will continue to carry the initiative forward. He creates offers that are in our best interest—it’s a testament to his management and leadership. Offers are generally made available to participants every spring and fall, including more than 750 individual titles and collections. Prices of all titles, as negotiated by the GLI, reflect a savings of 15-70% off retail pricing. Acquiring books, journals and databases electronically expands a medical facility’s access campus-wide, 24/7 and encourages wider usage of clinical resources. Resources are generally accessed via passwords or IP authentication with a hospital’s computer system, and remote access to electronic resources is also possible. Medical materials come to life, via audio, video, interactive applications and relevant links when accessed electronically, rather than the static text and two-dimensional graphics found in traditional hard-copy materials. Additionally, electronic resources can also enrich a hospital’s online services such as newsletters, conference reports, email links, discussion groups and more. HSLANJ has saved us tens of thousands of dollars. Robb (of the HSALNJ GLI) has made access to vendors much simpler because of the power of the dollars he can command. The publishers & vendors sit up a bit more when it comes to talking to us. We’re part of a hospital system but for a long time we were a small 196 bed hospital. Now having the power of HSLANJ… Vendors who wouldn’t normally talk to us will sit down and talk with us, to make things more cost effective. The most rewarding things about participating in the GLI… Being able to buy more resources, because they’re more affordable, plus knowing there’s technical support in the GLI consortium—the license is there and it’ll work well. As a medical librarian, you learn something new every day—you help make an impact on patient care… By utilizing the HSLANJ GLI, it not only saves us money but it saves us time. It would be challenging to find enough time to negotiate prices and do it all (ourselves).